DAZ Install Manager (DIM) 1.1.0.7, Now Available! DAZ 3D is pleased to announce the next public version of the DAZ Install Manager - version 1.1.0.7! The 1.1.0.7 version is a maintenance release and fixes or makes improvements to several issues discovered since the 1.0.1.115 General Release. More detail on specific fixes/changes/improvements can be found in the Change Log, which can be viewed online within the Documentation Center portion of our site. All new downloads of DAZ Install Manager will be of this version. I just upgraded install manager to version 1.1.0.7. Now I can't log in with the exact same creditials I used before the upgrade. I have added full permission to my firewall. Is anyone else having trouble logging in? All good here so far. I am downloading the DAZ Studio update at the moment. Update: I just installed DAZ Studio and the new Dynamic Player plug-in thru DIM 1.1.0.7 and it all went well. I unchecked the download filter for Public Build, but the files still show up in my Product Updates list. Edited to add: Now I see that the Public Build files don't have any tag for Public Build in order to filter them out. So what is the purpose of a filter for Public Build? Umm there is a NEW Full build, DS4.6.2.120, the Beta is not out yet. Check in DAZ Studio Discussions forum. I rebooted and it worked again. Yep DIM needs a Refresh to Read the Config file. Sorry I forgot that step. If you are referring to the issue with the Public Build filter not working, refreshing did not fix it. Closing and reopening DIM did not fix it, either. Is there something else I should try? Are there any server speed algorythm updates to put the speed back to where it was before? I'm not getting anything over 450kb's at time. Meaning if I try to select more than a couple of the downloads it will loose the connection. What I thought was a great piece of software has become the bane rather. confused...what exactly does this one mean?? "10) Implemented #IM-27/CS143447: Implemented thumbnail support in the Product Info Tip; actions for retrieving thumbnail(s) have been added to the view context menus, when connected"
If you are referring to the issue with the Public Build filter not working, refreshing did not fix it. Closing and reopening DIM did not fix it, either. Is there something else I should try?Yes a Close open should have worked. No Idea now. Adding support for a tag, and applying that tag to every package that could have it, are separate [albeit related] efforts. The former is what the bullet refers to. The latter I just got to. I understand. Thanks. I guess it will work sometime soon. It will be helpful to be able to hide beta versions. ...new version crashed and burned wiping it from my HD and desktop. This is the second consecutive time this has occurred after installing the update. ...new version crashed and burned wiping it from my HD and desktop. Select a product or group of products, then right-click (any products, on any of the three tabs) and select 'retrieve thumbnails'. DIM will hit the store and grab product thumbnails - and when you mouse over the item in the tab you will see the thumbnail as well as the order number, date, and tags and such. I did the whole shebang in about 10 to 15 minutes. ...crashed with some kind of odd code error after I selected the item I wanted to download. So now what? Providing crash info could be valuable to determine what crashed, and why. To amplify - the thumbnails are downloaded and stored in a directory called 'Thumbnails' in the InstallManager public directory. 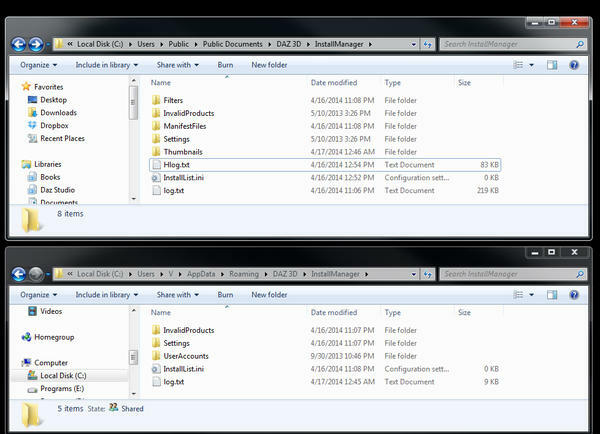 In Win7 the full path is C:\Users\Public\Public Documents\DAZ 3D\InstallManager\Thumbnails. Mine is taking 39 MB currently for 3,226 thumbnails. ...didn't get anything but a dialogue box that said there was an error. I clicked "Retry" several times then had to abort as it didn't fix the issue. When I clicked the "Abort" button that was when everything including the desktop icon vanished. Not been a very good day today for a number of reasons. that is brilliant....I've never seen that before - is it brand new in this version only? I used to have to hit the "read me" arrow for older products that i was unsure of the name...and of course, many of the older things don't have online readme's so i would have no idea what it was. LOL. ...OK this is even stranger. Checked the C drive and found folder named Daz3DIM1. In it were four folders three of which ("imageformats" "service", and "Uninstallers") were empty. Along with a bunch of .dll's there were two .exe files one named Daz3DIM.exe with a modified date of 02/19/2014 and another Daz3DIMHelper.exe which had today's date on it. The fact the three top folders are empty and the main .exe is dated February and not today, makes me feel what went awry during the last update caused this one to crash as well. I cannot find any log file to trace what happened. I thought of using CCleaner to uninstall, everything as I really don't wish to mess around with registry files after simply deleting everything, but again as there is no uninstall file there is nothing I can do. That's a fantastic new feature. Thanks for pointing out how to do it. 1. Why do the thumbnails get downloaded to the original Public Documents location? Filters/Manifests seem to also still be in Pub Documents. 2. Can I delete the rest of the crap from the Public Documents location as it's now defunct (or should be?)? The Public Beta that is currently showing up in Install Manager lacks the tag for it to be filtered. It also older than the current release. Next Public Beta will behave correctly. well that went smoothly apart from remembering who I am and my password. Reboot and run as admin fixed that. There is a significant speed increasing when opening DIM now which is nice. Lost all my settings - didn't know where Photoshop or Bryce was, that I didn't store my content in Public, what I had Hidden - so I had to redo all that before I could start downloading Gianni. I stand corrected, which looks something like the image below. The tags have been fixed on the previous Public Beta. Yes the standard location for Thumbnails/Manifests are in the public documents folder. Filters are actually an installed product so you can choose to have them or not by uninstalling/installing the product. They are useful so I would recommend leaving them. The rest of the folders(Invalid Products and Settings) and the files "log.txt", "HLog.txt", and "InstallList.ini" can be removed. We left them there in case there was an issue in migrating the settings to the new location. What changed is the placement of the Settings and InvalidProducts folders, as well as the installList and log files. Things that can be considered user or account specific. The things that are not necessarily user/account specific, like manifest files (installation records), thumbnails and installed filters [as opposed to user created filters] are left in the shared location. This is done because we either want to conserve system resources (i.e. thumbnails) in the event of multiple machine users or because the information represents the current state of the machine (i.e. manifests, filters); changing accounts on the machine doesn't change the fact that a product has been installed, or where it has been installed to. The folders/files that were moved can be safely deleted, assuming there were no issues with the migration. We left a copy in their previous location in case there were issues and they needed to be copied manually. The placement of manifest files and [now] thumbnails can be modified, and actually has been possible for several versions, but we've withheld the information because you can create some confusing problems for yourself if you're not careful or you do not fully understand the implications for what you are doing. ^^ It is for this reason that what I'm about to explain (below) is NOT officially supported. Each account created within Install Manager stores its settings in a configuration file, located at %AppData%/DAZ 3D/InstallManager/UserAccounts/.ini (or the Mac equivalent ~/Library/Application Support/DAZ 3D/InstallManager/UserAccounts/.ini) - the name of the file is percent encoded. This file contains a key named OverrideManifestDir (and now OverrideThumbnailDir), within the General section. Typically, the value of this key is left empty. When empty, the application stores [extended] manifests for installed packages in the default [all users] location. When a path is specified as the value of this key, the application stores these [extended] manifests, for any newly installed packages, at the defined path. Certain criterion are assumed with regard to the specified path - the path must be absolute, the path must already exist, the path must use forward slashes as a separator.